Hawken and other Western Mt. rifles. Just thought I would put up two links for your enjoyment concerning the Hawken shop (St. Louis, Art Ressel) and Green River Rifle Works, Leman trade rifle and Hawken Rifles. These two outfits likely did more for the Hawken and Leman guns then any other modern day operators. Art Ressel (of the Hawken Shop) had an outstanding collection of original Hawkens and used them to produce parts for building those guns. Art was mainly a supplier of parts although he always had a few custom builds on hand done using his parts. I had the privilege of spending a good bit of time with Art back then including examination and photography of Dr. Leonard's collection that was on loan to the Cody Museum. The Green River guys, Doc White, produced the Indian Trade rifle (created by "Blue Jacket Sanders, who left Paris IL to go work for Doc) and the Leman. GRRW was a full gun maker. I would suggest for you Hawken lovers that you look at the pictures of the originals from the Hawken Shop. You might notice some interesting things that get left off of modern made Hawken guns although the set of plans the Hawken shop had (taken from an original) show them quite well. Any way, sit back and enjoy the info. Re: Hawken and other Western Mt. rifles. I just don't understand what made Hawken go under? Those rifles are legendary. Good Stuff Huntschool! Thanks for sharing. it may be because it was the bmw/mercedes of pioneer and mountain men rifles, and there were only a few people (the hawkens) producing them by hand, of course. there were a LOT of firearms advancements happening from 1807 (the percussion cap) to the civil war and beyond (henry lever, revolvers, sharps, rollers, etc). not everyone could afford the latest technology and had to be content with what they could afford. from what i've read so far, there were a lot of brown bess muskets, nor'west trade rifles, nor'east rifles and fowlers, carolina flinters, all manner of long guns that form basically a cornucopia mish mash of what was available and what was affordable that were lugged around by those adventurous types. as the century moved nearer its mid mark, a lot of those flinters were "upgraded" to percussion, as well. so there were a lot of these guns around, they were easier to acquire, they were cheaper, and these particular guns (and sometimes their owners) didn't last very long in the mountains, plains, deserts, and so were cheaper to replace. at least all that sounds reasonable. Do you mean the original Hawken shop or the more contemporary shop owned by Art Ressel ? Just a few comments to put these wonderful guns in prospective. First, lets remember, this gun actually showed up in the form we all know in about in the early 1800's a bit of time after the percussion cap was invented and perfected. From that time on until the shop was sold to Gemmer the magic number for production of "The Hawken Rifle" has been pretty well resolved at 300 guns. I can remember many conversations around campfires regarding the number of guns with Baird, Ressel, T.K Dawson, Doc Carlson et al about this (and my next comment). One should also consider that there was the Leman gun and early Gemmer guns along with a whole bunch of NW trade guns, Harpers Ferry guns, customized military muskets and God only knows how many slender Eastern type guns making their way west. Those more lightly built guns lasted as long as their fragile make up allowed. Many were replaced by smooth bore guns like the NW trade gun just because there was more duplicity and lightness in said gun. There were distinct features to the Hawken guns that suited the type of use they would get over the long rifles of the East. One really noticeable feature of original guns is the "slight belly" on the fore arm. This extra wood was there to take the wear of being carried across the pommel of a saddle. Even at that, many guns have been noted as having a forged iron belly plate (such as the Mariano Modinas rifle) installed to cover wear through. The other advances in structure is the double bolt tang system into the trigger plate which certainly reinforces the wrist area a generally fragil area on a long rifle. Second, and this one is important.... there has never been a documented find of an original full stocked flint Hawken...... Period. There have been a few full stocked cap guns but never a flint gun. The only flint guns with the Hawken name I believe came from Christian Hawken in Hagerstown, MD and much proceeded Sam's move to St. Louis. The Hawken trigger guard with the finger spur on the guard is reminiscent of Christians work in MD. Just the ramblings of an old "Hawkenite"
actually, there is no proof of a half stock flint hawken ... though since they did make full stock flinters, the half stock flinter is the missing link to the half stock percussion hawken. all logic sez that maybe there were at least a few half stock hawken flinters. I am going to have to differ. In all of Baird's, Dawson's, Ressel's and Carlsons research as well as original accounts from the period.... there were no St. Louis full stock flint rifles of the genera made or known of. There were several known flint guns from Christianin MD. As to the half stock flinter there are none that I am a where of in any collection, museum or mention there of. FULLSTOCK FLINTLOCK GUNS are a bit of a Hawken anomaly. We know they made them, but none exist! At least, to the best of my knowledge, none has yet been found in it's original configuration. Half stock flinter. There is no historical evidence that the Hawken brothers built any halfstock flint rifles, but, considering only about 10% of their rifles have survived, who can really say? In conversation with Dr. Leonard back in the day, he felt there was a possibility of Sam having built a flint gun or so for the same speculation you and Selb use. However, there is no record of such a gun ever existing. I think Ressel even had shop records of builds back then and no flint guns were present. I am not sure of that. Baird said in conversation that there was no information regarding full stock flint guns to go by, though he had one built in .69 caliber with a Roller lock. Called it Bodacious. Doc White (GRRW) also said he had never seen or heard of a full stocked flint gun of this style. Leman, yes, Hawken NO. Just an old guy that has had his hands on a bunch of these guns and been involved with the guys that knew their stuff about them. EDIT: Rob; Those articles you added only go to point out what I said. Sure, the Hawken folk made flint guns but in the style (Long rifles) of their father from MD. Even in St Louis. I stand my ground based on my personal knowledge and time in this subject. There are no full stocked flint Hawken rifles of the style and period discussed that we have ever seen or heard about. As to the "look" of a lock being converted that can easily be explained as some other gun shop doing work on a gun that they were not capable of working on. Think rendezvous gunsmith. Locks could have been easily changed in the same fashion to keep the trappers gun working. the hawken brothers did build full stock "hawken" flintlock rifles in that these guns were made by them. the first one they ever built was the "ashley hawken", for general william ashley, in 1822. it was a joint jacob & samuel build, their first together. it was their #1 rifle, much has been written about it. did it look like their later hawken half stock percussion rifle, and/or have its features? no, it was totally diff'rent in every manner. there's a write up about this gun in the july and august 2017 'muzzle blasts' mag. the full stock or half stock flintlock hawken - that is, all the specific design features of their premier half stock percussion hawken, but with a flint lock and either a full or half stock - is only a theory, since there is no evidence such a gun was ever built. the bottom line to me is that the hawken percussion rifle was designed specifically for the 'mountain man', or adventurer trekking west of st. louis. it was the perfect cat's meow firearm for these rugged folks and in their most dangerous of venues, and thus it was coveted and sought out, but it was not the most prevalent mountain man gun. OK. So lets get this straight. Did the Hawken's build flint lock guns..... Sure they did. the Hawken brothers did likely build full stock flintlock rifles in that said guns were made by them. (changed by me). the first one they ever built was the "Ashley (built by the Hawken's) rifle", for general William Ashley, in 1822. it was a joint Jacob & Samuel build, their first together. it was their #1 rifle, much has been written about it. 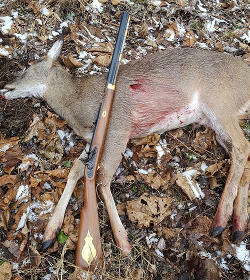 Did it look like their later Hawken half stock/ full stock percussion mountain rifle, and/or have its features? no, it was totally different in every manner. Here in lies the key. When I talk about Hawken guns I am referring to the rifle we all know about. "The Mountian Rifle." Simple enough. Just language and concept. I would be remiss not to add (my fault as I got going on this topic) but there is one gun in the Smithsonian if memory serves me that was examined by Ressel, Carlson, Baird et al that was declared to be a percussion conversion from flint. It is a full stock. My Bad..... I am sorry.